For the longest time I started to associate mayonnaise with Julia Child – and I still kind of do. Her fascination and obsession with it, as described in My Life in France, was the same as mine when I stumble upon some personal culinary discovery and tweaking it until I’m satisfied with it (or other food-related piece of info). It’s my analytical brain, I’m sure; there are some foods that I have an utter fascination for strictly in the preparation – just the sheer magic of it – but I’m not as crazy about eating it. In my local edition of Edible, there is an essay about mayonnaise followed by a recipe for preparing it. I have had past attempts at making mayonnaise, although not – in my view – very successful ones, at least not that I consider myself proud. Plus, I took issue with that one full cup of oil – back when I didn’t understand the chemistry of mayonnaise I thought it was too much. I thought it would be too oily. Like some things, such as mastering meringue without refined sugar or successfully poaching an egg, making mayonnaise and rising triumphant at the end is extremely gratifying. Now with experience under my belt, I feel that same, deep wonder that Julia Child felt. Mayonnaise, from a scientific point of view, is an amazing miracle of nature. 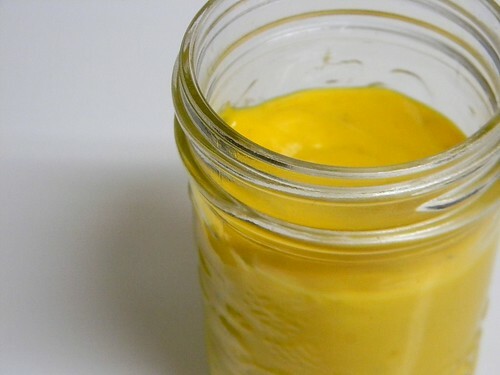 It’s an emulsion of oil and water, from the lemon juice or vinegar, and that emulsion is neatly bound together with the help of the lecithin from the egg yolks, which thickens it. The oil, though, also plays a key part – as the water component gets broken down into fine droplets by constant whipping the oil is able to get between those droplets and further aid in thickening it. 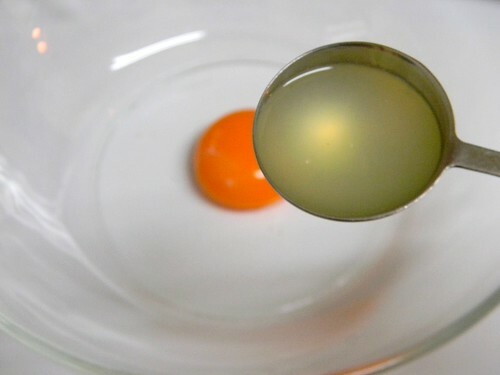 With this knowledge, is then understood that the lecithin in the egg yolks simply would not be enough to thicken such a mass amount of liquid and also understand why that, as you continue whipping and slowly add the oil drop by drop, it gets thicker. You may not be able to tell but as I sit here typing that out, I am so excited – it gives me a little thrill and my heart skipped a beat when I learned that! It was a revelation. Perhaps it sounds as if I am exaggerating but I’m not; it’s really only the computer screen that restrains me from totally geeking out. Let us say that suppose I were telling this to you in person, imagine this being expressed with unrestrained, ecstatic enthusiasm, like a little kid on his birthday or at Christmas. The instructions are written for doing this by hand, although you could also use an electric mixer or blender if that’s your preference (note that I have not done it with either appliance, however). I say “about” since you may not need a full measurement depending on your preference for how thick you like mayonnaise. 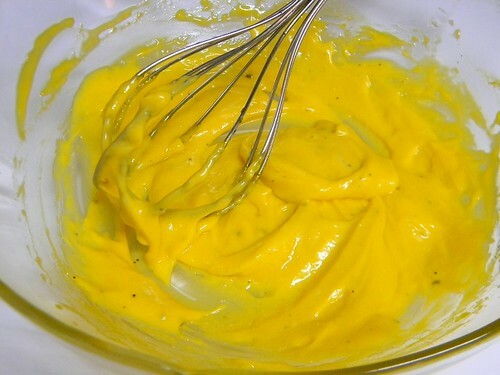 This makes a smaller amount of mayonnaise than shown in the final photos (about half), suitable if this is your first time making mayonnaise from scratch, so using only about 1/2 cup of oil. The kind of oil you use affects the flavour of the mayonnaise. Feel free to also use a combination of oils. I used extra virgin olive oil and it consequently had a prominent olive taste until I flavoured the mayonnaise afterward with some salt and pepper and a little Dijon mustard to taste. Feel free to flavour your mayonnaise as you like. 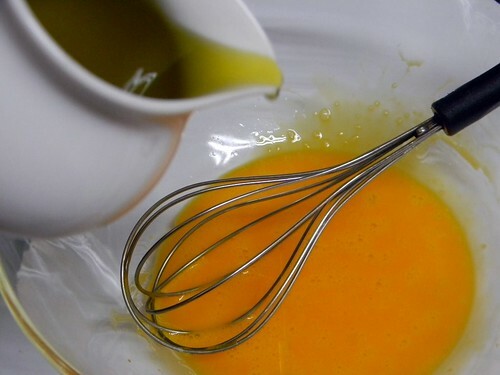 Whisk the egg yolk with the lemon juice and salt until pale. Add the oil in small increments at a time, drop by drop to a light stream or drizzle and whisk until fully mixed in with the egg, about 10 to 15 minutes. 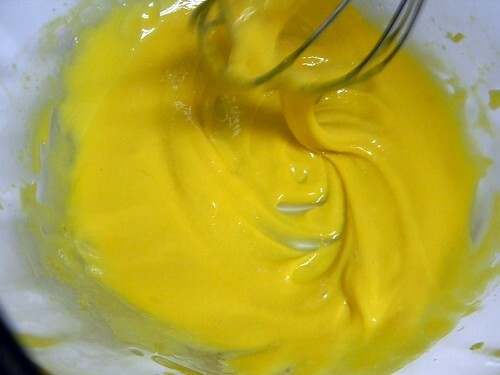 You may have to stop adding the oil periodically should the oil start to separate from the mayonnaise, if it does, simply whisk it back into the mayo until emulsified once again. When finished, the result should be a thick and fluffy, spreadable condiment. You may not use all the oil (I had about 1/8 cup left). Taste the mayonnaise and add salt and pepper, to taste, if necessary. Add any other ingredients (starting with a small amount and continue adding small amounts until deemed satisfactory) that you wish to flavour your mayonnaise with, taking into account the flavour of the oil (or oils) that you used. 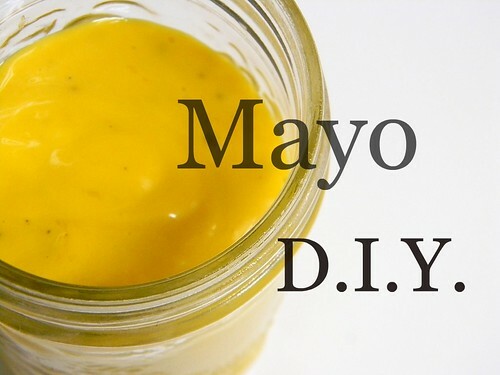 Transfer mayonnaise into a container and seal, refrigerating until ready to use. Zoe, I have talked about making my own mayo FOREVER!! And I cannot believe that I still have never really done it, other than helping my Mom make it. I guess it is time to change that! Thanks, Kim, and you’re most welcome! 🙂 Now that I’ve made mayonnaise, that’s the only mayo that I want to eat – I cannot bring myself to using the store-bought one (soy) in the fridge right now. My Mum quite likes it, although it’s not tangy enough for her. For people who like more of a tang in their mayonnaise, I’d suggest using white vinegar instead of the lemon juice or a combination thereof. Hi Shirley, gee whiz! I wonder why it’s not working? It works for me. That was my concern about making mayo, too, with the twist that I wasn’t sure if the rest of my family would like it and, if not, I’d have to eat it all (that’s what determines a lot of my cooking/baking actually) so that’s why I initially went for the smaller portion. It went quickly making sandwiches! I made more today, with 2 yolks and almost a whole cup of olive oil after we ran out of my mayo and the soy one!